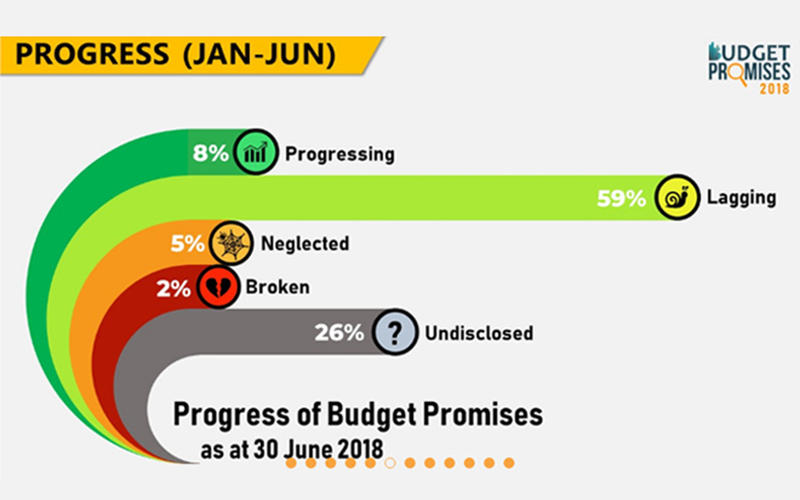 Oct 16, 2018 (LBO) – Sri Lanka’s private think tank Verité Research has found out that only 8 percent of promises announced in the 2018 budget are progressing on track through the end of the first six months of this year. The research firm has also found out that progress on 33 percent of proposals is either broken, neglected or undisclosed. “This means that the government is either not doing what it is saying or not saying what it is doing for promises amounting to 60,200 million rupees,” Analyst at Verité Research, Hasna Munas told reporters at a media briefing. The firm said while the government’s progress in implementing its budget promises remains stagnant, its willingness to disclose this information has declined. In the first half of 2018, information progress for 74 percent of the tracked promises was either not available or obtained with difficulty. In nearly 60 percent of the promises being tracked, government institutions have failed to provide the action plan or progress report in response to a request filed by the firm under the RTI Act. Verité Research further said that only 33 percent progress reports could be compared against the action plans received. “In the 2018 budget speech, Finance Minister announced that an implementation unit would be set up under the ministry to monitor the execution of the proposals,” Team Leader of Verité Research, Vidya Nathaniel said. Budget promises tracker tracks new expenditure proposals, or ‘promises’, in the budget speech which have an allocation of over 1,000 million rupees. In 2018, the platform is tracking 38 such promises, with a total value of 149,350 million rupees. This amounts to over 82 percent of the total value of new expenditure proposals in the 2018 Budget Speech. The platform assesses each of these promises, using two indicators: Openness and Progress. More information on the budget tracker here.